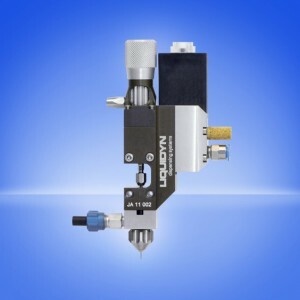 Intertronics’ introduction of the new Liquidyn P-Jet CT Jetting Valve brings to manufacturers the capability for high performance micro-dispensing of materials such as oils, greases, adhesives, silicones, paints, flux, pharmaceutical media and other chemicals, including filled fluids. Its speed and accuracy is expected to be valuable in the electronics, solar, automotive, packaging and medical device industries, amongst others. The Liquidyn P-Jet CT represents a significant technical innovation for high process demands as found in high technology production. This newly enhanced contactless micro jet valve can dispense quantities as small as 3nl at frequencies of up to 280 shots per second. The Liquidyn P-Jet CT can apply dots, beads or .lines of low to medium viscosity liquids with high repeatability and greater than 97% accuracy. This level of performance was achieved by making improvements to the driving mechanism together with the introduction of a dispensing needle which can be easily changed, thus making it particularly convenient in situations such as the dispensing of highly abrasive materials or frequent process changes. All fluid handling components can be separately autoclaved, which may enable its use in certain medical or food applications.